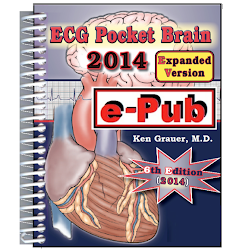 ECG Blog #147 (AV Block - PACs - Mobitz I, II). The long lead II rhythm strip shown in Figure-1 was diagnosed as showing 2nd-Degree AV Block, Mobitz Type II. Do you agree with that assessment? If not — What is your diagnosis? NOTE: This is a difficult arrhythmia to interpret. That said, we present numerous Pearls on arrhythmia interpretation throughout our discussion that should be of value for interpreters of any level. Are you up for the challenge? Figure-1: Long lead II rhythm strip that was interpreted as showing Mobitz Type II 2nd-Degree AV Block. Do you agree? NOTE — Enlarge by clicking on Figures — Right-Click to open in a separate window. i) Are there P waves? — or, if no clear P waves, then are there signs of atrial activity (such as “fib waves” or atrial flutter)? ii) Is the QRS wide? — for which we accept anything more than half a large box in duration (ie, >0.10 second) as qualifying as a “wide” QRS. iii) Rate? — What is the ventricular (and the atrial) rate? iv) Regularity? 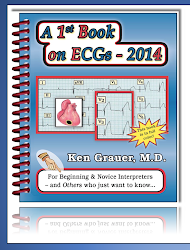 — Is the ventricular (and atrial) rhythm regular? v) “Related”? — Is there is a specific relationship between QRS complexes and neighboring atrial activity? NOTE: It does not matter in what sequence you assess the Ps, Qs & 3Rs — as long as you always assess each of these 5 key parameters. We often vary the sequence in which we address the Ps, Qs and 3Rs — depending on whether atrial activity, QRS width, and/or rhythm regularity is easier or harder to evaluate in the particular rhythm we are looking at. PEARL: By remembering to always “Watch Ps, Qs and the 3Rs” — you have at your fingertips an easy-to-recall method to ensure that you are always systematic (as well as time-efficient) in your approach and, that you never forget to assess each of these 5 essential elements. By religiously applying the “Ps, Qs & 3R Approach” to every arrhythmia you encounter — even if the specific etiology of the rhythm remains elusive — you will have narrowed down diagnostic possibilities, and clarified which specific parts of the rhythm you are still uncertain about. Start with what you know! If there are easier parts to interpret in a tracing (as well as more complicated parts) — Begin with the easier parts! Is there is an underlying rhythm? If there are a number of sinus-conducted beats on the tracing — it is often easiest to first identify these sinus beats, and to leave for later interpretation of the more difficult portions of the arrhythmia. Use Calipers! You’ll be amazed at how much “smarter” you instantly become the moment you begin to regularly use calipers for the interpretation of challenging arrhythmias. Your colleagues will marvel at how much more focused you become by regular application of this simple measure. Even the experts do better when they use calipers! Remember: The cardiologist who does not use calipers to interpret complex arrhythmias — is a cardiologist who will not always come up with the correct interpretation. Figure-2: We have numbered beats and labeled sinus P waves from Figure-1. The QRS complex in Figure-2 is narrow. Although ideally we would have access to all leads on a 12-lead ECG before committing to comment on QRS duration — the QRS complexes in this tracing clearly look to be narrow and supraventricular. The ventricular rhythm is not completely Regular. That said, there is a pattern to this rhythm — in that “group beating” is present, with 3 groups comprised of 3 beats each in a repetitive pattern. Sinus P waves are evident (RED arrows) — as recognized by the presence of upright P waves with similar morphology in this long lead II rhythm strip. The P-P intervals appear to be constant, with the exception of 2 short pauses that occur at the end of each group (ie, after beat #3 and after beat #6). The Rate of the rhythm varies — but it is neither excessively fast, nor excessively slow. There does appears to be a consistent Relation between a number of sinus P waves and neighboring QRS complexes. That is, the PR interval preceding beats #2,3; #5,6; and #8,9 appears to be constant (albeit slightly prolonged). Although this rhythm is complex — there does appear to be an underlying sinus rhythm — because an upright P wave with fixed PR interval precedes no less than 6 of the 9 beats on this tracing (ie, beats #2,3; #5,6; and #8,9). A much shorter, but still constant PR interval precedes the 1st beat in each of the 3 groupings. We need to explain WHY this is so. We also need to explain why the rate of sinus P waves is not constant throughout this tracing — and why short pauses punctuate each of the groups. 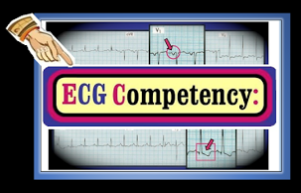 Diagnostic Possibilities: Two clinical entities should come to mind as possible explanations for the ECG findings described above. These are: i) some form of AV block; and ii) Blocked PACs. Let’s consider each of these possibilities in turn. There is NO 2nd- or 3rd-Degree AV Block in Figure-2. Despite the apparent increase in PR interval between the 1st and 2nd beats in each grouping — the rhythm in Figure-2 is not AV Wenckebach. This is because the premise of AV Wenckebach (which is also known as the Mobitz I form of 2nd-degree AV block) — is that there should be an underlying regular sinus rhythm throughout the tracing. The PR interval with AV Wenckebach progressively increases, until one or more of the regularly occurring sinus P waves is not conducted. However, RED arrows in Figure-2 show that regular sinus P waves do not continue throughout this tracing. For similar reasons, this rhythm does not represent the Mobitz II form of 2nd-degree AV block. First, the PR interval does not remain constant (as it should if Mobitz II was present) — and second, the P-P interval of sinus P waves does not remain constant throughout the rhythm strip as it almost always does for virtually any form of AV block. Finally, this rhythm cannot be complete (ie, 3rd-degree) AV block — because there is conduction of a number of sinus beats (ie, beats #2,3; #5,6 and #8,9 are all conducted with a constant PR interval). PEARL: The most common cause of a pause is a blocked PAC! This phenomenon occurs far more often than is generally appreciated. Blocked PACs are a much more common cause of pauses than any form of AV block. The challenge diagnostically, is that blocked PACs may be extremely subtle and easy to overlook. The secret is to look for blocked PACs whenever you encounter any unexpected pause. How to Look: Carefully examine at the ST segment and T wave at the onset of the pause. Compare this ST segment and T wave at the onset of the pause (ie, the ST-T wave of beats #3 and #6 in Figure-2) — with the ST-T wave of all normally conducted sinus beats on the tracing. Is there any difference? NOTE: We fully acknowledge that detecting blocked PACs may be challenging. One has to distinguish between minor variations that naturally occur from beat-to-beat in the ST-T wave — from notches or deflections that are the result of a premature P wave buried within (and therefore deforming) the ST-T wave. 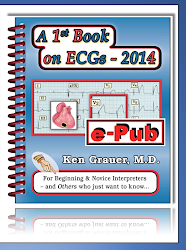 For Practice: We illustrate detection of blocked PACs in our ECG Blog #33 and Blog #57. Once you begin to routinely look for blocked PACs whenever you see an unexpected pause — I guarantee that you will find them with surprising frequency! Test yourself looking for signs of blocked PACs in Figure-2. Look carefully in at the base of the T wave at the onset of each pause — paying special attention to the T wave after beat #6. Be sure you have magnified the tracing by clicking on it to view in a separate window! We illustrate our answer below in Figure-3. Figure-3: We have added a RED-BLACK arrow at the base of the T wave near the beginning of each pause (See text). Answer: Note subtle angulation at the base of the T waves of beats #3 and #6 at the onset of each pause (RED-BLACK arrows in Figure-3). This subtle deformity is not present in the T waves of all other beats on this tracing. We strongly suspect this angulation at the base of these T waves is due to blocked PACs. These blocked PACs then reset the SA node — and this accounts for the brief pause that follows beats #3 and #6. Final Question: Why is the PR interval at the end of each pause shorter than the PR interval of normally conducted sinus beats? Answer: The reason beats #1, 4 and 7 all manifest a shorter PR interval than beats #2,3; #5,6; and #8,9 — is that beats #1, 4 and 7 are junctional escape beats that occur before the sinus P waves preceding them have a chance to conduct! From the consistent-length PR interval preceeding beats #2,3; 5,6 and #8,9 — we can see that sinus conduction in this tracing requires a bit more than 0.20 second. In Figure 3 — the junctional escape focus fires before the P waves preceding beats #1, 4 and 7 have enough time to conduct. Finding #1: The R-R interval preceding the 2 junctional beats is the same! (ie, the R-R interval between beats #3-4 and between beats #6-7 is identical). The reason these 2 R-R intervals are the same, is that this R-R duration corresponds to the junctional escape rate. Finding #2: QRS morphology of the 3 junctional beats on this tracing (ie, beats #1,4,7) is slightly different than the QRS morphology of sinus-conducted beats. That is, the R wave of beats #1,4 and 7 is slightly taller — and the S wave slightly smaller — than the R and S waves for each of the sinus-conducted beats. Although this difference is exceedingly slight — it appears to be real, and provides an invaluable clue that beats #1, 4 and 7 are indeed junctional escape beats (and that the P waves preceding beats #1, 4 and 7 are not being conducted). This further supports our premise that this rhythm is not AV Wenckebach. PEARL: Sometimes (not always) the QRS morphology of AV nodal beats will look different in some slight way from the QRS morphology of sinus-conducted beats. This is because one never knows from where within the AV junction a nodal beat arises (ie, junctional beats could arise from one or another marginal edge of the AV node) — in which case the “path” that this supraventricular junctional beat travels may be just a little bit different than the path traveled by normal sinus-conducted beat. Recognition of this consistent slight difference in QRS morphology when it occurs can at times provide an invaluable clue as to which beats on a rhythm strip are sinus conducted vs which beats arise from the AV node. Comment: We fully acknowledge that additional monitoring of this patient would be needed to definitively prove our theory for the mechanism of this fascinating arrhythmia. And, it is true that on occasion a single definitive interpretation of a complex arrhythmia may simply not be possible from the surface ECG. That said — We feel the above discussion clearly provides a plausible explanation for all findings noted on this tracing. For clarification — Figure-4 offers a laddergram illustration of our theory. Figure-4: Laddergram illustration of our theory for the mechanism of this arrhythmia. The underlying rhythm is sinus with a long PR interval. Several PACs are seen. These occur with a short coupling interval — and are therefore non-conducted to the ventricles (RED Triangles). This resets the SA node, therefore delaying the next sinus P wave. 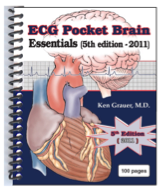 Because of the resultant brief pause — junctional escape beats (#4 and #7) arise, and are conducted to the ventricles before the sinus P waves preceding beats #4 and #7 are able to conduct to the ventricles. Therefore, this arrhythmia entails sinus rhythm (with prolonged PR interval); blocked PACs; and appropriate emergence of several junctional escape beats. Clinical Implications: There is no 2nd- or 3rd- AV block in this tracing. Clinical implications for this patient are the same as they would be for anyone having PACs and slight prolongation of the PR interval. This usually entails search for a cause of the PACs, with corrective measures (ie, caffeine restriction; treatment of heart failure or electrolyte disturbance, etc.) if/as clinically indicated. In the absence of other forms of heart disease — the isolated presence of 1st-degree AV block is usually of minimal clinical significance. The brief pauses terminated by junctional escape beats manifest a completely appropriate response to blocked PACs that reset the SA nodal pacemaker. In short — this is most probably a fairly benign arrhythmia. NOTE: Even though the precise mechanism we postulate for this rhythm is advanced — the basic principles discussed in this blog post are within grasp of any clinical provider. Use of the Ps, Qs & 3R Principle should organize your approach and narrow your differential to the entities we consider. Mobitz I and Mobitz II forms of 2nd-degree AV block can easily be ruled out — because the atrial rate is not regular. Complete AV block is ruled out because there clearly is conduction of a number of beats. Appreciation of the clinical truism that “the most common cause of a pause is a blocked PAC” should then lead you to the correct diagnosis! Acknowledgment: My thanks to Robert Drutel for allowing me to use this tracing and clinical case. Please note that if you click on SHOW MORE on the You-Tube page under where this video appears — You’ll see a detailed linked Contents that will allow you to immediately find whatever key points you are looking for in this video. 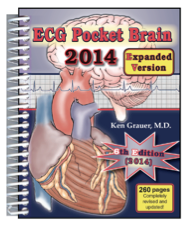 For more on the recognition of Blocked PACs — Please see my ECG Blog #33 and Blog #57. With practice — you will begin to find blocked PACs with surprising frequency! The ECG in Figure-1 was obtained from a patient with new-onset chest pain. It was interpreted as showing LBBB (Left Bundle Branch Block). As a result, the provider thought — “impossible to tell if anything acute is going on because there is LBBB”. Figure-1: 12-lead ECG from a patient with chest pain. How do you interpret this tracing? NOTE — Enlarge by clicking on Figures — Right-Click to open in a separate window. Clinical NOTE: In the past, it was thought that one could not diagnose an acute STEMI (ST Elevation Myocardial Infarction) in the presence of LBBB. This notion has been completely refuted. Although it will often be more difficult to diagnose acute ischemia/infarction in a patient with chest pain who presents in complete LBBB — in a surprising number of such patients, there will be at least strong suggestion on the initial ECG of acute STEMI despite the presence of underlying LBBB. When acute ECG changes in a patient with LBBB are subtle — diagnostic aids such as Smith-modified-Sgarbossa criteria may be helpful. At other times (such as for the ECG in Figure-1) — the diagnosis of acute STEMI is obvious without need to invoke modified Smith-Sgarbossa criteria. 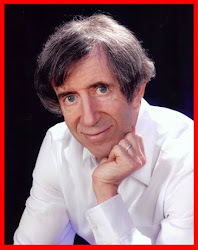 (NOTE: Search of Dr. Stephen Smith’s web site at the above link will provide numerous examples of how his criteria can be applied to clinical cases). i) The presence of septal Q waves in lateral leads I and aVL. Because the presence of LBBB alters the direction of initial septal activation (which can no longer proceed from left-to-right) — there should never normally be a septal q wave in a lateral lead when there is uncomplicated LBBB. The prominent Q waves in leads I and aVL of this tracing leave little doubt that infarction has occurred at some point in time. Beyond-the-Core: The presence of one or more lateral Q waves in association with LBBB do not indicate “lateral” infarction. Instead, they indicate septal and/or anteroseptal infarction — since the reason for their occurrence is that the LBBB has altered the direction of initial septal activation. ii) There is ST segment coving and primary ST elevation in lead aVL. This just shouldn’t be seen with typical LBBB. The most reliable way to recognize acute STEMI that occurs in association with LBBB is by the presence of frank ST elevation in a lead that should not show ST elevation. So, while it is admittedly challenging to determine if the anterior ST elevation that is seen in Figure-1 is a result of LBBB or acute anterior STEMI (because there is often some normal ST elevation in anterior leads with simple LBBB) — there should not be ST elevation in lateral or inferior leads. iii) There are reciprocal ST-T wave changes in each of the inferior leads. We know the inferior ST-T wave changes that are seen here are likely to be both real and acute — because these inferior ST-T wave changes are a “mirror-image” reflection of the ST-T wave in lead aVL. This reciprocal change picture shouldn’t be seen with uncomplicated LBBB. iv) The final abnormality occurs in the chest leads, and is indeed subtle — but it supports the above limb lead findings. That is, the ST segments in leads V5 and V6 are coved — and manifest a disproportionate amount of J-point ST depression (considering the modest amplitude of the R wave in these leads). This abnormal shape of the ST-T wave extends to lead V4. (We think there are also tiny-but-real q waves in lateral leads V5 and V6). Clinical Impression: In a patient with new-onset chest pain — the combination of the above findings should suggest an acute evolving STEMI until proven otherwise despite the presence of underlying LBBB. NOTE: Access to a prior ECG on this patient would clarify whether the LBBB in Figure-1 was new — and, would help to establish that the above noted changes are acute. But in the absence of a comparison tracing — the history (of new-onset chest pain) in this patient whose ECG shows LBBB with inappropriate lateral Q waves and primary ST-T wave changes despite the LBBB, should strongly suggest acute STEMI with need for immediate evaluation and reperfusion therapy until proven otherwise. Follow-up: Unfortunately, the cardiac catheterization lab was not immediately activated for this patient. The patient coded in the hospital, and could not be resuscitated. Acknowledgment: My thanks to Casey Caldwell for allowing me to use this tracing and clinical case. 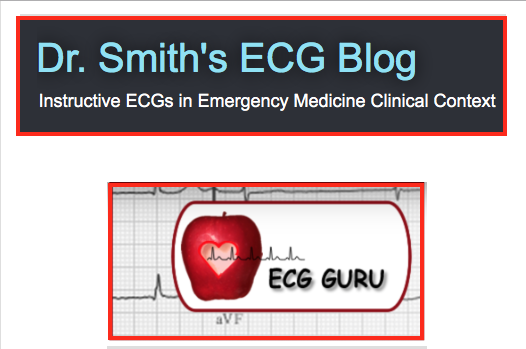 ECG Blog #145 – (ST Depression – STEMI – BBB). The ECG in Figure-1 was obtained from a 60-year old woman who presented to the ED (Emergency Department) with new-onset chest pain. The initial emergency care provider interpreted this tracing as showing complete RBBB ( = Right Bundle Branch Block). Do you agree? Are you concerned about anything else? Figure-1: 12-lead ECG from a patient with new-onset chest pain. How do you interpret this tracing? NOTE — Enlarge by clicking on Figures — Right-Click to open in a separate window. Beyond-the-Core NOTE: Although it clearly appears that there are upright P waves with a constant and normal PR interval in lead II — a number of leads also display some sort of ‘notching’ toward the tail end of the QRS complex (especially leads II, III, aVR, V4, V5). Caliper measurement suggests that the timing of these extra deflections is not quite at the precise midpoint between sinus P waves (as I would expect it to be if there was 2:1 AV conduction). Thus, although I am fairly confident that the rhythm here is indeed sinus tachycardia — I am not 100% certain, and would entertain the possibility that there could be 2:1 conduction … The point to emphasize is that sometimes it is simply not possible to be 100% certain of the rhythm at the time you need to initiate management. That said, in this case regardless of whether this rhythm is sinus tachycardia or atrial flutter (or atrial tachycardia) with 2:1 AV conduction — initial clinical priorities are similar. The QRS complex is wide. QRS morphology is consistent with complete RBBB (ie, predominantly upright QRS in lead V1 — with wide terminal S waves in leads I and V6). However, a deep Q wave is present in lead V1. This suggests that in addition to RBBB — septal infarction has probably occurred at some point in time. There is ST segment elevation in lead V1 (by ≥3mm! ). 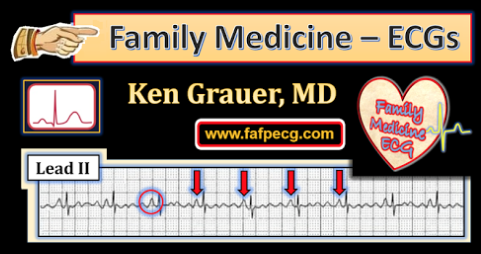 This should not be seen with simple RBBB (See my ECG Video on the Basics of BBB). Using the principle of “neighboring leads” — it should be apparent that there is also some coved ST segment elevation in neighboring lead V2! Normally with RBBB — one expects the ST-T wave to be at least slightly depressed in anterior leads in which a RBBB-pattern is seen. There is also marked ST elevation (of 3-4mm) in lead aVR. Virtually all other leads on this tracing manifest ST depression, which is marked (up to 5-6mm) in many leads! The finding of diffuse ST segment depression (ie, in at least 6-7 leads) in association with ST elevation in lead aVR strongly suggests diffuse subendocardial ischemia as the cause. Clinical Impression: At the least, the rhythm in this 60-year old woman with new chest pain is sinus tachycardia. Serial ECG monitoring should clarify whether extra P waves are or are not present. There is complete RBBB — evidence of prior septal infarction at some point in time — and, of most concern strong suggestion of diffuse subendocardial ischemia. Although on occasion, ST segment elevation may also be seen in lead V1 (in addition to aVR) when there is subendocardial ischemia — ST elevation is usually not seen in lead V2. Especially in view of the deep Q wave in lead V1 — one should consider the possibility of acute septal infarction. Otherwise, when the ECG picture of diffuse ST depression in association with ST elevation in leads aVR and V1 is seen — this is most often not due to acute coronary occlusion. Instead, severe coronary disease (ie, left-main, proximal LAD and/or multi-vessel disease) is most often found. Given the severity of this patient’s new-onset chest pain — the marked tachycardia — the RBBB conduction defect — and, the dramatic amount of ST segment deviation — prompt diagnostic cardiac catheterization is clearly indicated for this patient. This hopefully will suggest potential for life-saving PCI (percutaneous coronary intervention). Follow-up: Cardiac catheterization confirmed the presence of very severe 3-vessel disease. Acknowledgment: My thanks to MG for allowing me to use this tracing and clinical case.